Heat conduction in solids is similar to the conduction of electricity in electrical conductors in many aspects. 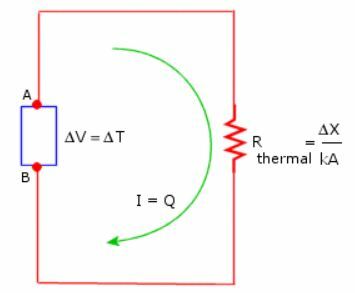 In a conductor, the flow of electricity is driven by a potential difference and so is the flow of heat driven by a difference in temperature. In electric conduction, electric charge is transported from one point in a conductor to another by the motion of the electrons, in thermal conduction, heat is transported from one point of a solid to another by the vibration of the molecules of the solid due to their increased energy. where Q is the rate of heat transfer in Watts. The next figure shows the analogy between the two phenomena.